Sealing damp stains is essential before applying any paint or wallpaper to your wall surfaces. Patches of damp can appear for a number of reasons – burst or dripping pipes, weeping radiator valves, leaking waste pipes or a broken roof tile are all possibilities. Investigate the cause and get it fixed before dealing with the decorative aspect of the repair. Damp stained areas can only be redecorated successfully if the cause of the damp has been eradicated. The sequence below shows the simplest techniques for sealing damp stains. 1. 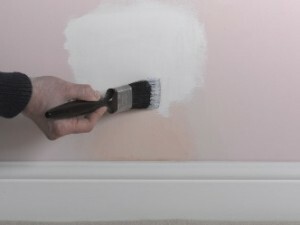 As well as sorting out the cause, you must allow the area to dry thoroughly before redecorating. 2. Wallpaper must be removed from the area, otherwise simply paint over the damp stain with stain block, ensuring even and complete coverage. 3. As an alternative, you could use an aerosol stain block. However you must take care not to try and apply too thicker coat as this will cause the sealer to run/drip. Better to apply two or three thin coats. 4. 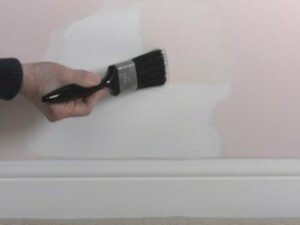 Whichever stain block you use, when it is dry, simply overpaint with your chosen topcoat colour. 5. Two coats should always be applied to achieve the best finish. Allow the paint to dry thoroughly between coats. Damp is often caused by exterior masonry problems. Once a year, inspect your house’s exterior to ensure that the mortar pointing between bricks is sound. Also make sure that soil or debris is not piled up above the damp proof course. Blocked gutters are a common cause of damp problems. This can be easily resolved by making sure that your gutters are cleared of debris at least once a year. Consider using leaf guards in the gutter lengths and downpipes in order to prevent blockages. As soon as you find a damp problem, take immediate measures to find the cause, and make a repair. If left untreated, damp can seriously damage the fabric of your home and, in most cases, the solution is neither expensive nor time-consuming. Damp can cause wet or dry rot. Both types of rot are fungal attacks that rely on damp surfaces and environments in order to take hold. Dry rot which is characterised by web-like fungal growth, tends to break wood down into cuboid like shapes, ruining its structure. It can spread across masonry surfaces making it a particularly damaging problem. If identified early, small areas can be treated with easily available products. For more extensive problems, professional help will be needed. For the best damp sealer on the market, check out Zinsser BIN – which you can read about in my guide – “The top 10 of DIY”. This entry was posted on Friday, September 17th, 2010 at 1:25 pm	and is filed under 'How-to' Guides, Preparing Surfaces for Decoration. You can follow any responses to this entry through the RSS 2.0 feed. You can leave a response, or trackback from your own site.